The first convincing evidence that the amino acid methionine plays a role in catalysis in an enzyme has been uncovered by researchers from the University of Bristol. Previously, it was thought that methionine was only involved in structure and binding, not in making reactions happen in enzymes. 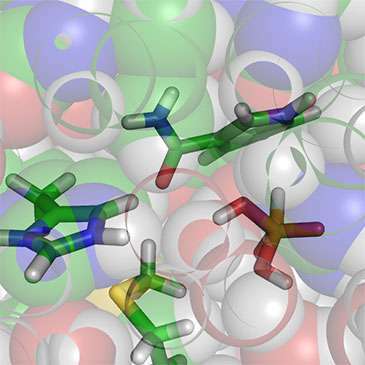 Using molecular simulations, Dr Kara Ranaghan and Professor Adrian Mulholland from Bristol's School of Chemistry found an interesting interaction involving a particular methionine residue in the enzyme phosphite dehydrogenase. Their collaborators at the University of Illinois at Urbana-Champaign, US, led by Professor Wilfred van der Donk, then investigated this effect by mutating the methionine and replacing it with either natural or unnatural amino acids. These experiments showed that replacing the methionine slowed down the rate of the reaction without significantly changing other properties of the enzyme. This indicates that it is involved in catalysis, that is, in making the reaction happen more quickly in the enzyme. QM/MM (quantum mechanics/molecular mechanics) simulations of the reaction then showed how the methionine is likely to do this by stabilizing a particular group in the protein during the reaction. Analysis of structural databases by Bristol's Dr Tiddo Mooibroek, Dr Gail Bartlett and Professor Dek Woolfson showed that this type of interaction is also seen in other proteins and other molecules. Professor Mulholland said: "As our research indicates that this type of interaction is likely to be important in other enzymes, it could ultimately help in the design of new proteins with applications in medicine and bioengineering."